Sony announced two new e-readers, a full-featured touchscreen edition and a smaller, portable e-reader that costs $100 less than Amazon’s popular Kindle. The Sony Reader Touch Edition comes with a 6-inch touchscreen good for navigating the software menu, turning pages on e-books, highlighting text and more. The e-reader will be available by the end of August and cost around $299, the same as the most recent edition of Amazon’s Kindle. Sony’s second new e-reader, the Reader Pocket Edition, is a more basic e-reader with a 5-inch screen and will cost around $199 when it launches at the end of this month, $100 less than the Kindle. The two new Sony e-readers can both store up to 350 e-books and run for two weeks on a battery charge, the company said in a statement. They can also be used to read e-books from a variety of Web sites, including 500,000 free public domain titles from Google, Sony said. The devices support several standards, including Sony’s BBeB (Broadband eBooks) format, the ePub (electronic publication) free standard by International Digital Publishing Forum, Adobe PDF formats and Microsoft Word. The new e-readers from Sony appear to lack some of the popular features on Kindle, including the 3G wireless hookup Amazon uses to deliver books to the Kindle users and the text-to-speech function that allows users to listen to e-books in audio. The Kindle’s text-to-speech function has raised controversy because some publishers want to keep their rights to sell audio books in addition to text books. Kindle can also store up to 1,500 books on its 2GB of flash memory, far more than the new Sony e-readers and their 512MB of flash. The new Sony e-readers boast the same screen resolution as Kindle at 600-by-800 pixels, and their battery life per charge is far higher at two weeks compared to four days on Kindle. The Sony drive to create a more free atmosphere for e-books also means it may be able to offer a greater number of e-books compared to the 300,000 Amazon says are available for Kindle. 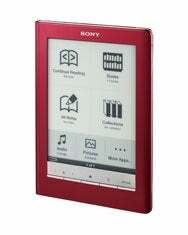 The new Sony e-readers will be available in the U.S. online at SonyStyle.com, and stores including Best Buy, Costco, Staples, Target and Wal-Mart. New e-books and New York Times best sellers will be available on the eBook Store from Sony for $9.99. The software Sony makes for use with its e-readers, eBook Library software 3.0, now supports many Macs as well as PCs, Sony said.